Let’s face facts. You’d be lying to yourself if you said that you didn’t love some juicy gossip every once in a while. For some this may include something saucy about what of your coworkers around the watercooler. For myself and my fellow techies, we go wild for tech rumors. Hearing about the possibilities of new gadgets and the features that they may include is always a plus for our days. We even go crazy for rumored upgraded models of the tech we already have. What can we say, we like have the the most updated “best of the best”. In case you’re unaware of the 2014 Macbook Air, allow me to share the rumors that are currently circulating all over the internet. SPOILER ALERT: The rumors are awesome. The 2014 Macbook Air has an extremely strong chance of being unveiled at the Apple World Wide Developers Conference in June. Rumor has it that we should expect to see the some of the same features on the new Macbook Air that are on the most recent iteration of the Macbook Pro. Lets just look at the possible display for a second. Two words; Retina Display. That’s right. The new Macbook Air will more than likely (at least more so than any of the other rumors) feature the 2560 x 1600 retina display that some of the latest Apple tech features. The current Macbook Air doesn’t have a bad display module by any means, but with competing laptops like Sony’s VAIO Pro 11 and it’s 1920 x 1080 pixel display, the current Macbook Air’s 1400 x 900 pixel display just don’t match up with the rest of the competition. There is a bit more to the “display” than Apple may be letting on though. I should really be saying “displays”, as there is talk of a SECOND screen on the back. Now I know that doesn’t like the most practical thing, but the company’s explanation of purpose seems pretty legit. Seeing as how Apple already has the patent for the “Electronic device display module”, we may be seeing a screen where we normally expect one, as well as one on the back of the laptop. Now the current Air already has pretty good battery life. Naturally, we can expect to see and even better batter for the new model. The icing on the cake for the second display, aside from giving possible updates on things like the weather without having to open the laptop itself, is the possibility of a solar charging panel within the second display module. Let’s hope that this is a thing! Contact www.RentOurLaptops For Your Next MacBook Air Rental! The new Air may also be coming in just one size. 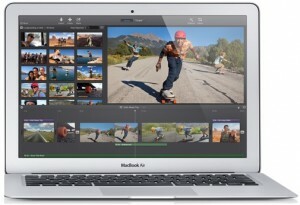 The current Macbook Air comes in the 11 inch screen and 13 inch screen. The next gen version may only come out in a 12 inch model. Definitely not a bad call, as it would allow Apple to sell the last gen version sizes at more affordable price points. The new model might also be host to a buttonless touchpad this time around. While most Macbooks have the touchpad that you can “click”, the new model will possibly integrate a touchpad that utilizes pressure sensors instead. As long as it remains as responsive as a regular button, it definitely won’t be a bad addition to the new model. Just in case you’ve not even worked with the current Macbook Air, but you want to just to get the feel of how much more powerful the new version will be, it never hurts to try one out. Obviously you’re going to want to save your pennies for the new model, so renting the current Air might be the best way to go if you’re interested in the newest model. Previous Post: The Samsung Chromebook 2 Is On It’s Way, And It Looks Nice!